Watch year: 2005. All images shown are of the actual watch. 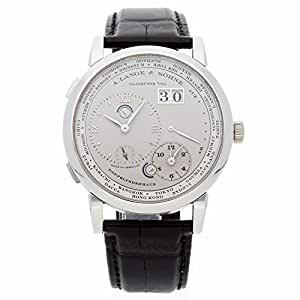 Pre-Owned A. Lange & Sohne Lange 1 Timezone (116025) manual-wind watch, features a 41.9mm platinum case surrounding a rhodium dial on a brand new black alligator strap with a platinum tang buckle. Functions include hours, minutes, small-seconds, date, power reserve indicator, day/night indicator, world-time and dual time zone.Â This watch does not come with box or papers. We back this watch with a 15-month warranty!. Buy with confidence knowing each timepiece goes through the same rigorous 31-point inspection. Rest assured only authentic parts straight from the manufacturer are used. The Certified Pre-Owned Program on Amazon ensures peace of mind and transparency via standardized reports and a 1 Year Warranty Provided by WatchFacts.